1. On a dry Autumn day, take a nature walk and collect an assortment of fallen leaves – lots of different shapes, colours and sizes. 2. Talk with the children about the leaves, why they fall, how the trees change appearance. What colour leaves have you found? What different shapes and sizes? Do you know the names of the trees they have fallen from? 3. 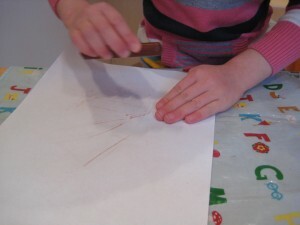 When you get home make rubbings of some of the leaves. Place the leaf flat on the table with a piece of paper on top. Using a wax crayon (in autumnal red, green, brown, orange or yellow) carefully rub over the hidden leaf and watch the print emerge as if by magic. Use the flat length of the wax crayon rather than the end you would use when writing. 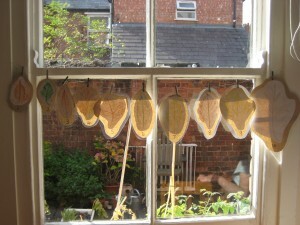 Make rubbings of 10 leaves of different shapes and sizes. Using two colours on some leaves looks good. 4. Cut out the leaves and stick them on to a piece of paper or card in a contrasting colour. Cut around each leaf on this paper/card, leaving a small border to frame each leaf. 5. Work with the children to arrange the 10 leaves in a line, starting with the smallest leaf and progressing to the biggest. 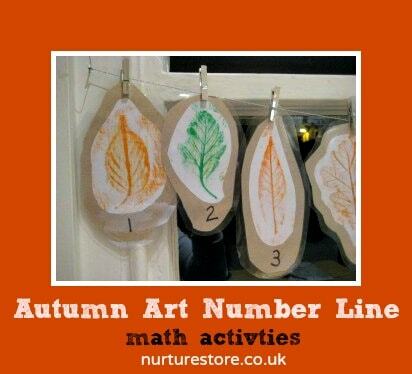 Then write the numbers 1 to 10, one on each leaf, working from the smallest to the largest. This helps the children see the numbers as increasing. 6. We laminated the leaves to make them sturdier, but this is optional. 7. Stick your leaves up! We used a string and tiny pegs (the type you can get to hang up Christmas cards). Place them somewhere prominent that the children will see frequently and refer to them – for example to count out how many plates you need at lunch time. The children will soon start talking about the numbers and recognising them. This is fantastic! I would definitely use this also, you could use so many different areas of learning in this! Lovely to use nature this way! Looks so pretty too… another one we could do a playgroup! PS thanks for linking up to Kids Get Crafty! Thanks Amandab. I like a homemade version so we can update it seasonally and a new version every so often catches the children’s eye and gets them interested in it afresh. 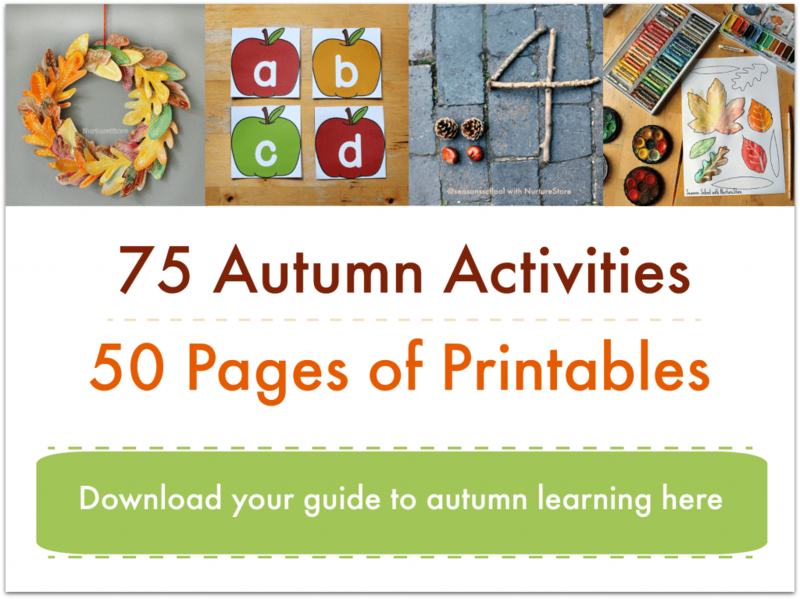 My 6 yr old will love all of these left activities!! So fresh and sensory orientated! Thank you! !